I know I have mentioned that my son is a bartender, and he comes up with some terrific drinks, which I will be posting soon. But he was out of town this weekend PLUS I was cruising around Pintrest and found a blog called Endless Simmer. The have a section they call Endless Poptails where they make “adult” popsicles. I love the idea but know that I would be the only one here eating the popsicles so that could be dangerous. A drink however? Ya, everyone here was down with that idea! So I decided to take their Watermelon Blackberry Margarita Poptail idea and run with that. That is how Watermelon Blackberry Jargaritas came to be! Place a few of the watermelon ice cubes into the cocktail shaker. If you don’t have a cocktail shaker you can use two glasses together. 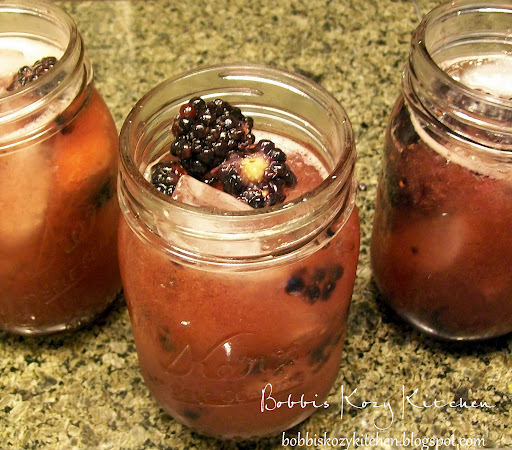 Add a few of the blackberries (I used about 5), about 4 ounces of the limeaid and tequilla, and 2 ounces of the Grand Marnier. Shake to blend. Add a few regular ice cubes to the jars (or glasses) and pour the cocktail over the ice allowing a few of the watermelon ice cubes to fall into the glass. Garnish with a fresh blackberry. You can see this post plus many more on the Newlywed Blog’s linky party.